Steven Soderbergh’s second film to be shot on iPhone, High Flying Bird, interrogates the business side of professional basketball. Its discomforting lenses make (relatively) less sense. But the narrative is all too compelling. Thus, Unsane and High Flying Bird make a compelling point-counterpoint. 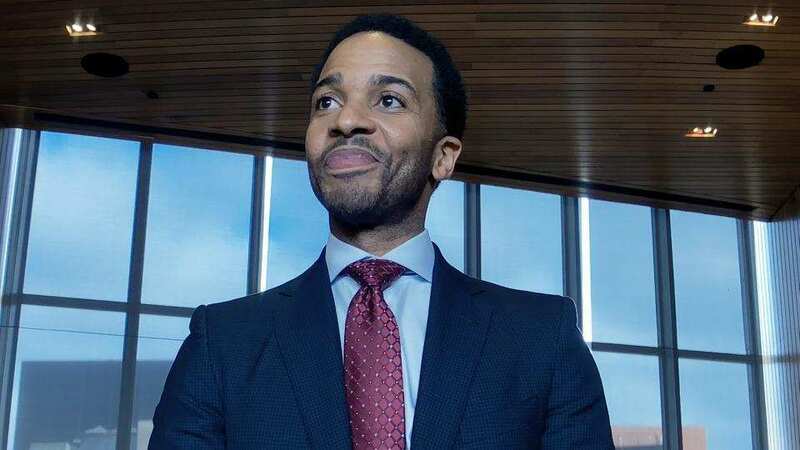 The plot of High Flying Bird concerns Ray Burke (Andre Holland), a representative of NBA prospects who is facing a lockout and the potential loss of clientele. It is not so much the sport that is on display here, though, but the sport of taking ownership of the NBA image. Tarell Alvin McCraney’s script poses this question of ownership. Who is allowed to control the NBA player’s image? The player? The NBA proper? Media? Social media? Reps? The bosses of those reps? It is a continuing stream of fish swimming for the upper hand. Most of these fish are adversarial yet superfluous, like Kyle MacLaughlin’s David Seton, Zachary Quinto’s David Starr, or Sonja Sohn’s Myra. They are merely pawns in the game of the talky plot. The talkiness of this script is compelling, the sentiments of its characters grounded, but the pawns are one too many. There is something entrancing about Soderbergh’s lensing. Frames are sometimes jagged. Sometimes clean. Sometimes flat and empty. Sometimes cavernously deep and empty. The difficulty in lighting off iPhone lens attachments sometimes causes shadows that crowd faces or otherwise blown-out lighting that pierces against the edges of faces. It is a unique aesthetic, but not one that is altogether aesthetically pleasing. With Unsane, the low-budget, low-tech aesthetic amplified uneasiness. Here, it is a camera that calls attention to itself. Whether it strikes your fancy or not, it is noticeable. For me, that noticeability is not an asset. Soderbergh’s new venture, this low-tech approach, is both a fascination and a distraction. It is inventive, to a degree, and it is risky. Not to mention that the up-front aesthetic presents an immediate shift to the tonal energy of his films. But the iPhone-shot film is still in a nascent stage. Tangerine acted as a disrupter. Now, Soderbergh is trying to market the concept. But High Flying Bird is visually off. It is this noticeability, which acts to distract from what McCraney’s script is achieving. McCraney is writing a stage play. It is incisive and sharp, and the dialogue cuts through to your attention span and takes control. Having strange depth cues and off-kilter lighting does not add to this experience, it detracts from it. As successful as Soderbergh is at harnessing the technological limitations he chooses for himself, the experiment is not helping the cause.